We’d love your help. Let us know what’s wrong with this preview of Carioca Fletch by Gregory McDonald. Fletch’s trip to Brazil wasn’t exactly planned. But it’s Carnival time in Rio and he has plenty of money, thanks to a little arrangement made stateside. And it took him no time to hook up with the luscious Laura Soares. Fletch is beginning to relax, just a little. But between the American widow who seems to be following Fletch and the Brazilian widow who’s fingered Fletch as her long-dead husband, he suddenly doesn’t have much time to enjoy the present or even get a wink of sleep. To ask other readers questions about Carioca Fletch, please sign up. This novel is a bit of an enigma. It's clearly a Fletch novel because Fletch is the main character and because it covers an important event in his character's history--what happens weeks after the closing events in the first Fletch novel (Fletch). This also isn't a Fletch novel. Fletch novels feature Fletch playing the role of an investigative journalist in some form. This is Fletch in the liminal state. He still is Fletch, but he's running from being Fletch…and he clearly isn't working. (He doe This novel is a bit of an enigma. It's clearly a Fletch novel because Fletch is the main character and because it covers an important event in his character's history--what happens weeks after the closing events in the first Fletch novel (Fletch). This also isn't a Fletch novel. Fletch novels feature Fletch playing the role of an investigative journalist in some form. This is Fletch in the liminal state. He still is Fletch, but he's running from being Fletch…and he clearly isn't working. (He does reluctantly deal with a mystery, but only because he is the mystery.) The events in Brazil will end up making him even more Fletchy--he has a trial by Carnival before he can get there. This is really a story about Brazil. It's a story of Rio and Carnival that Fletch just happens to fall into, like James Bond falls into the woman's story in The Spy Who Loved Me (which is totally different than the movie--no metal-mouthed baddie in that book). Though Fletch comes out a lot more transformed from this book than James Bond did in that story. I read that McDonald waited to tell this story until he could actually spend time in Brazil to capture it correctly. Brazil is here all the way through. Fletch is in Brazil long enough to start to understand it, but just long enough to illuminate a few of its mysterious ways. Carioca Fletch takes Fletch and deposits him in Rio in the middle of Carnival week. Part travelogue, part mystery, part comedy, the story has Fletch accused of murder and followed halfway around the world by a bereaved widow, sealed in a coffin, possessed by the spirit of a man who died forty years ago, burying bodies at sea, beaten to an inch of his life, confused, dismayed, a stranger in a strange land. This isn't a plot-driven story as much as it's a series of glimpses of a few days in Rio an Carioca Fletch takes Fletch and deposits him in Rio in the middle of Carnival week. Part travelogue, part mystery, part comedy, the story has Fletch accused of murder and followed halfway around the world by a bereaved widow, sealed in a coffin, possessed by the spirit of a man who died forty years ago, burying bodies at sea, beaten to an inch of his life, confused, dismayed, a stranger in a strange land. 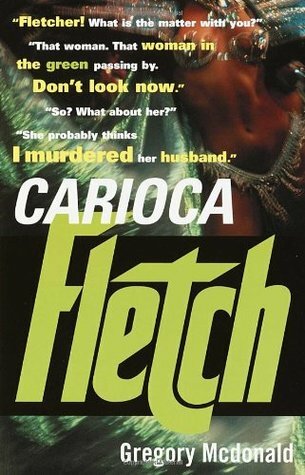 Following a few months after the original book Fletch, Carioca Fletch begins with a jolt of plot as an old woman from one of the favelas of Rio de Janeiro identifies Fletch as the reincarnation of her long dead husband and wants to know who murdered him 47 years ago. Everyone apparently believes her wholeheartedly and there's nothing Fletch can do but go along with what might be an elaborate joke. Nearly simultaneously Fletch runs across a widow who he says will think he killed her husband! And Following a few months after the original book Fletch, Carioca Fletch begins with a jolt of plot as an old woman from one of the favelas of Rio de Janeiro identifies Fletch as the reincarnation of her long dead husband and wants to know who murdered him 47 years ago. Everyone apparently believes her wholeheartedly and there's nothing Fletch can do but go along with what might be an elaborate joke. Nearly simultaneously Fletch runs across a widow who he says will think he killed her husband! And so the mystery begins??? As it turns out the woman Fletch initially dodges because he says she'll think he killed her husband is Joan Stanwyk. She's had him tracked down so that she can confront him about her husband's death as well as a large amount of money that has gone missing. Seemingly only minutes later, Joan disappears just before Carnival and there isn't much Fletch can do to find her. I had hoped for more mystery on this front, but the solution is wrapped up in a few scant pages right at the end. There's some great description and depiction of the Brazilian culture and the piece feels like a reasonable travelogue in some sense. Sadly it means it's a bit thin on plot. Things start off with a nice bang, but then plod along for most of the book before things begin to pick up again in the last quarter of the book. There was so much more that Mcdonald could have done with the plot. Joan Stanwyk tracking down Fletch for a confrontation, Fletch and the Tap Dancers disposing of a friend's body in a scene that presaged the entire plot of the film Weekend at Bernie's (1989), the detective portion relating to who killed Junio all those years ago... Instead Mcdonald seemingly lets all the plot points work themselves out without any real work from our protagonist who just floats along through the culture. However, I will give him huge points from an artistic standpoint as he's done a great job instilling a particular pace and cultural way of life into the text in such a manner that it really seems natural and satisfying that things work out the way they do. Yet, in the end ultimately I'm conflicted as I'd have preferred more Fletchness, but I find it to have been enjoyable--at least it was better than Fletch, Too which still sits poorly with me. Why wasn't there better development of a romantic interest? I don't recall if this or something else set things in motion from a cultural standpoint, but as I recall the mid-80s, this would have ridden at the forefront of the zeitgeist of Brazillian culture in North America with several other books, television shows, and even movies which featured Brazil and even capoeira at the time. "You have not heard of queima de arquivo?" "It means 'burn the record'" Marilia said. "It means 'cover up,'" Laura said. "It is the Brazilian way of life. That is why we are so free." "Half your diet should be carbohydrates." "Anyone can make up a story and say it is the past." "Have you ever been paralysed?" Toninho's big brow eyes swelled. "I have the wisdom to know that one day I will be." Fletch gathered in the stern line. "Not in the S.S. Coitus Interruptus." ...cheering on the biggest and most amazing human spectacle in the world except war. "Fletch, you always seem to be someplace you're not supposed to be, doing something you're not supposed to be doing." "Got any other news for me?" (a waitress to Fletch) "Have an accident?" "No, thanks. Just had one." "I was worried about you. I've been stood up for dinner before, often, but seldom for breakfast." "Not very nice of me." "It's okay. I had breakfast anyway." "I mean, everyone needs a vacation from life. Don't you agree?" "She fell out of her cradle. She's enjoying a few moments crawling around the floor." "I'd love to know what." "Oh, that the past asserts itself. That the dead can walk." Fletch thought of the small carved stone frog that had been under his bed. "That the absence of symbols can mean as much as their presence." In theory 'Carioca Fletch' is the seventh published book in the Fletch series, although it follows almost directly on from the first, 'Fletch'. I say 'in theory' because whilst I'm not entirely sure what this is, it sure as heck isn't a Fletch book! Best guess I can make is a free-form, drug fuelled travelogue of Rio and surroundings during carnival, featuring some bloke who goes by the name of IM Fletcher. Gone is the clever writing and electric dialogue, and in its place resides something some In theory 'Carioca Fletch' is the seventh published book in the Fletch series, although it follows almost directly on from the first, 'Fletch'. I say 'in theory' because whilst I'm not entirely sure what this is, it sure as heck isn't a Fletch book! Best guess I can make is a free-form, drug fuelled travelogue of Rio and surroundings during carnival, featuring some bloke who goes by the name of IM Fletcher. Gone is the clever writing and electric dialogue, and in its place resides something someone perhaps thought was art. The lack of pretty much everything I have enjoyed about McDonalds work means this is a painful experience. I suspect if this had some out as the second book it would have killed the series stone dead. At least I got through it relatively quickly, but not because it was a page turner! This was the first Fletch book I've read. It reads just like watching one of the fletch movies. Probably one of the greatest openings in a book. Fletch finds himself in Rio at the start of Carnival. His meeting with the beautiful Laura Soures and plenty of cash. When a woman comes up Fletch tells his guest that she is probably there to accuse him of her husband death. All this in the first chapter. A Brazilian widow accuses Fletch of being her long dead husband who had been murdered. She says he This was the first Fletch book I've read. It reads just like watching one of the fletch movies. Probably one of the greatest openings in a book. Fletch finds himself in Rio at the start of Carnival. His meeting with the beautiful Laura Soures and plenty of cash. When a woman comes up Fletch tells his guest that she is probably there to accuse him of her husband death. All this in the first chapter. A Brazilian widow accuses Fletch of being her long dead husband who had been murdered. She says he came back as Fletch to name his killer. How does this even happen. It happens the I.M. Fletcher that's for sure. I'm not really sure what story Mcdonald was trying to tell here. This is definitely an interesting look at Carnival in the 80s in Rio. He obviously spent time there and researched his story well. I just don't know if there was something to connect to in the story. I also have issues because I'm a little OCD when it comes to reading series characters. I've been reading this series in the order that they were written expecting them to be chronological as well. Unfortunately for me, this is really I'm not really sure what story Mcdonald was trying to tell here. This is definitely an interesting look at Carnival in the 80s in Rio. He obviously spent time there and researched his story well. I just don't know if there was something to connect to in the story. It was okay. Not the best in the series. It's funny that he wrote/released them out of order for the chronology in the book. This falls right after Fletch (The book the movie is based on). But it doesn't hinder the story at all. It feels like a number of events in the novel don't really have much to do with the "case". Just things that happen on the way to the end of the book. But it won't kill you to stick with it. Reading books older than 2000 on my to-read shelves. It’s interesting to see how they handle race, gender and other social behaviors. Fletch is actually more progressive than others. This was the worst of the series so far. It just seemed less organized and interesting then the previous. McDonald's writing here follows his pattern of making you think things aren't important until they become important. It was nice to see this pick up the story of Fletch in Brazil after the debut novel. I really enjoyed it. So vague and ungood. Unfortunate. It came together better towards the end but there was no driving force. Enjoyed this more than when I first read it. Follows on from Fletch with the hero in Rio for carnival and involved in a 50 year old murder case. This story fills in a gap in the Fletch storyline, but it's not much of a mystery. It's a quick read, though, and it's always fun to catch up with Irwin Fletcher. I like the Fletch series; very diverting and good plotting. The female characters are frequently sexual foils for the main character, which can get old, but in general I like the books quite a bit. What is special about the Fletch books is the plotting, which frequently involves at least two mysteries, if not more. In this case, there was the mystery of the missing North American woman in Brazil during carnival, the mystery of Fletch's doppleganger, who was murdered 45 years prior to the time of I like the Fletch series; very diverting and good plotting. The female characters are frequently sexual foils for the main character, which can get old, but in general I like the books quite a bit. What is special about the Fletch books is the plotting, which frequently involves at least two mysteries, if not more. In this case, there was the mystery of the missing North American woman in Brazil during carnival, the mystery of Fletch's doppleganger, who was murdered 45 years prior to the time of the novel, and the mystery of how to understand Brazil. McDonald used culturally transmitted information such as Brazilian superstitions and fairy tales to inform how characters behave, and which turned out to be crucial to solving the mysteries. This was quite a deft touch. This was decent book but it was not a good book. Sequels rarely live up to the original and Carioca Fletch did not disappoint in that regard. Again. it wasn't a bad book and I enjoyed seeing Fletch in Brazil living it up. It had multiple mysteries happening at the same time and yet I never became confused or forgot what was happening. My problems come towards the end of the book where we are given two chapters of pure exposition on Carnivale with little to no actions. McDonald rewards us for our p This was decent book but it was not a good book. Sequels rarely live up to the original and Carioca Fletch did not disappoint in that regard. My problems come towards the end of the book where we are given two chapters of pure exposition on Carnivale with little to no actions. McDonald rewards us for our patience with a very nice very graphic scene after but why did we need to sit through all the parade description? I was still in high school when I read the first Fletch book. It was 1982. The first Fletch novel was released in 1974. I used to read a lot of mysteries back then and one day stumbled upon Fletch, I was hooked, that's all the mystery I wanted to read during that time (peppered in with some fantasy, science fiction and literary books, too). I read all the Fletch books up to the last one, "Fletch Too", in 1986. This one was particularly fun for me, because I was born in Rio and have been back man I was still in high school when I read the first Fletch book. It was 1982. The first Fletch novel was released in 1974. I read all the Fletch books up to the last one, "Fletch Too", in 1986. This one was particularly fun for me, because I was born in Rio and have been back many times since on vacation. I have fond memories of reading these mysteries, I thought the books were funny and fun. An extremely long short book. I had always been curious about what happened to Fletch after he arrived in Rio. Especially since I first read Fletch when I was a teenager growing up in Sao Paulo (yeah, I'm a paulista, not a carioca). Now I'm no longer curious, and this was a letdown. It reads like something a famous novelist would write after visiting Rio at Carnival. Some of the small details ring true, but my god, does this man over-romanticize Rio and Brazilians. Ultimately, the mysteries and ch An extremely long short book. This is a very atmospheric and unusual entry to the Fletch novels, and takes place a few months after the exploits of the original novel; Fletch has moved down to Brazil and is embroiled in mystery after an old woman claims him to the doppelganger of her husband, murdered 47 years previously. Taking place during the hyperreal Carnivale, Carioca Fletch enters surreal territory, dragging its reader in with it. OK - but not great. Fletch is in Brazil and has no job but does have a girlfriend. He gets embroiled in solving a murder 47 years in the past when he is mistaken for the dead man by his widow. Hijinx galore around Carnival with Fletch getting no sleep for 3 days and nearly killed by his former murderer. Enjoyable, but not fantastic. Another great Fletch mystery. Many people complain that there is too much Brazil and not enough Fletch, and compared to other Fletch books, that is true. However, the book is so well written that I really don't mind Fletch taking a back seat to Brazil. If you like Mcdonald's writing style, you'll like Carioca Fletch. Don't believe all of the negative reviews on amazon. One of the more entertaining and memorable Fletch novels in my opinion, this one takes the lead character to Brazil, where he befriends and parties with locals, adapts to society, and tries to figure out why so many people are mistaking him for a late village hero. I am re-reading this series in chronological order. This is probably my least favorite in the entire series. However, it is pivotal in tying together the early storylines and some of the latter. Still some very good writing by McDonald. I read the Fletch books for (a) the effortless writing, and (b) the oddball mysteries. This one is as easy a read as the others, but the mysteries are pretty simplistic. McDonald was way more interested in capturing the spirit of Brazil than writing a mystery. So this is what you get.